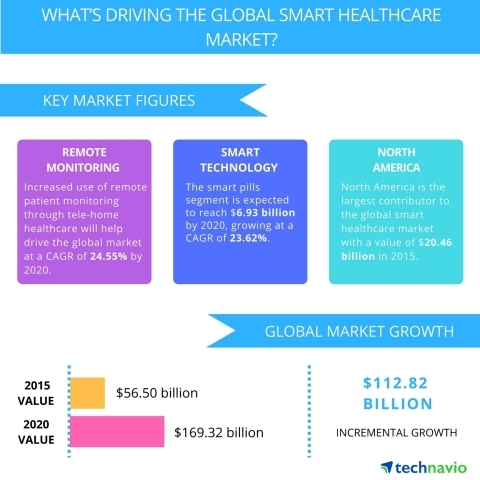 LONDON--(BUSINESS WIRE)--Technavio analysts forecast the global smart healthcare market to grow at a CAGR of almost 25% during the forecast period, according to their latest report. Most wearable healthcare devices function on GPS, wireless networks, and M2M technology. Therefore, the battery life of these devices is very low because of their high-power consumption. This also affects the durability of these devices and, therefore, has the potential to affect the demand for smart wearable healthcare devices in the coming years, which will have a direct impact on the market. Smart healthcare products provide an essential part of the solution to provide healthcare to the population. Smart healthcare products with embedded technologies, such as communication technology, sensor technology, and data analysis techniques, monitor an elderly person physically for the diagnosis and ongoing treatment of cardiovascular, neurological, and pulmonary diseases. The steady growth of the aging population and increase in the incidence of diseases along with higher healthcare costs are major concerns in today's world. However, people are gradually becoming concerned about and aware of their health. Increased health consciousness among people is reflected in the rapid growth in demand for hygienic foods, gym memberships, healthy nutrition, and diet programs, and in the use of mobile health applications. Also, increased health consciousness is likely to continue to drive the demand in the market. “Risks associated with obesity include diabetes, joint problems, high blood pressure, high cholesterol, cancer, gall bladder problems, breathing difficulties, and coronary artery diseases. People use various smart healthcare and fitness products to reduce these risks,” adds Abhishek. Smart wearable devices help consumers track and monitor their health on a regular basis. Individuals use these devices to support heart rate; monitor body temperature, remote cardiac, and calorie burnt; and records sleep statistics (even of babies). These devices help users avoid several health issues such as obesity and heart congestion. Healthcare devices can be synchronized with mobile devices, such as smartphones and tablets, that help the users monitor sleep patterns and receive calendar alerts about their medical activities. Thus, the popularity of these wearable fitness devices among consumers is likely to increase the demand of smart wearable healthcare devices and services during the forecast period. The emergence of cloud-based IoT platforms is paving the way to high performance through the formation of strategic alliances between telecommunication operators, hardware and software providers, and analytics software providers. These alliances help technology vendors boost the sales of their products and services. Alliances also lead to the development of new products and services. Become a Technavio Insights member and access all three of these reports for a fraction of their original cost. As a Technavio Insights member, you will have immediate access to new reports as they’re published in addition to all 6,000+ existing reports covering segments like IT hardware, IT security, and ITO and BPO. This subscription nets you thousands in savings, while staying connected to Technavio’s constant transforming research library, helping you make informed business decisions more efficiently. Technavio analysts forecast the global smart healthcare market to grow at a CAGR of almost 25% during the forecast period, according to their latest report.